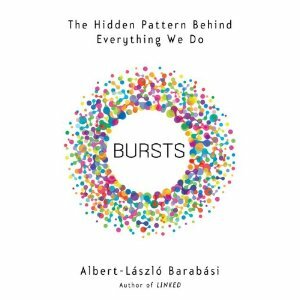 I’ve just finished reading Bursts by Albert-Laszlo Barabasi, whose previous book Linked was a big influence on my thinking when I read it 5 years ago so I was excited about this follow up. Essentially he tells 2 interwoven stories, one of his pioneering research into network theory, and the other of the medival Crusades which was an interesting narrative technique but I must confess I was much more interested in the first story than the second. Regarding his academic work, he has looked at how much complex human behaviour follows a sort of brownian motion of random bursts. He has studied, together with his research group, douzens of data sets from the pattern of email traffic, to travel routines, and showed that they follow a predictable pattern, namely following a power law rather than a normal distribution. He goes on to tackle über-thinkers such as Popper and Heisenberg who showed how uncertainty is inherent in the world/universe which therefore makes it inherently unpredicatable. Instead, Baribesi argues that this uncertainty drops off at scale and so concludes that we are much more predictable than we previously thought. I find his arguement a little hard to digest. Whilst I certainly recognise the macro trends that arise from all of our little unconscious habits and routines, I guess I believe that different things happen at scale and instability is somehow a fundamental component of connected and large scale systems. However I look forward to being proven wrong. The thing that get’s me is that we all crave predictability – I know I do – and it feels like it almost hard wired into our DNA. And yet we seldom get it. Most predictions are wonderfully wrong and yet we barely notice. I think everybody should study a history of futurology to drive that point home. In any case it’s the random interactions that make live worth living. We devour speakers and writers who offer us predictions – modern day soothsayers if you will – but they are so often prooved wrong yet we seldom hold them to account. More important than our ability to predict is our ability to respond. Love your last line. Kind of like a line I’ve used in one of my workshops – how agility is not about velocity, but about responsiveness. And how I too ‘love’ the realm of predicting future trends, it is very alluring. I too like the last line!